One of the most interesting design elements of brioche knitting is that it creates two separate yet connected layers making the knitting reversible. Each of the layers can have their own characteristics. The layers can be different colors, different yarns and even worked differently like adding increases on one side and decreases on the other. The “keyhole” in this scarf came naturally. 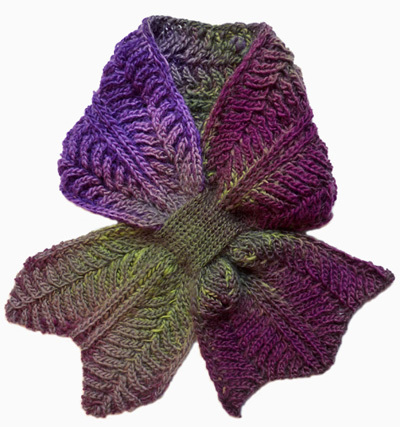 You begin with a 2-color brioche “lace” stitch pattern. You use “make 1 (m1)” to increase and work 5 stitches together to decrease. After working the pattern and creating one cabbage leaf, you separate the layers and work each layer in ribbing, hence the keyhole. To continue, you place the stitches back onto one needle and brioche to the following keyhole opening. You finish by making the second cabbage leaf. If you work this pattern in a thinner yarn such as a kid mohair/silk, the pattern is then much “lacier”. If you work with two high contrasting colors your result would be distinctly reversible. Whatever your yarn choice, your “Rodekool” will always be an attention-grabbing piece. Note: In the scarf shown, only one ball of yarn was used for both MC and CC; one color was worked using the end of yarn from inside the ball, the other color was worked using the end from the outside of the ball. If you choose to use two different balls of the same color instead, just be sure the balls do not begin at the same point in the color sequence. 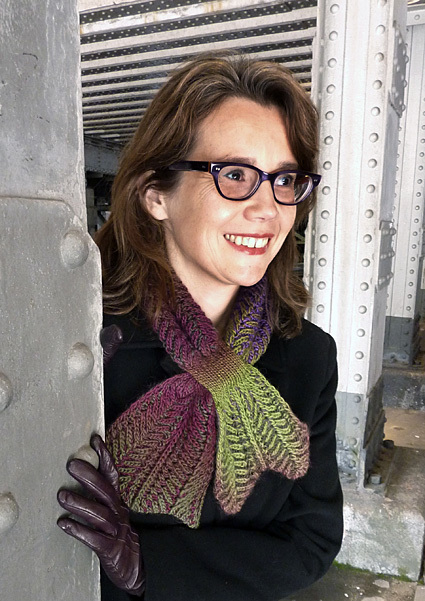 There's also a handy video tutorial for this pattern from the designer here. You will also need to thoroughly understand the specific brioche stitch abbreviations as described below. 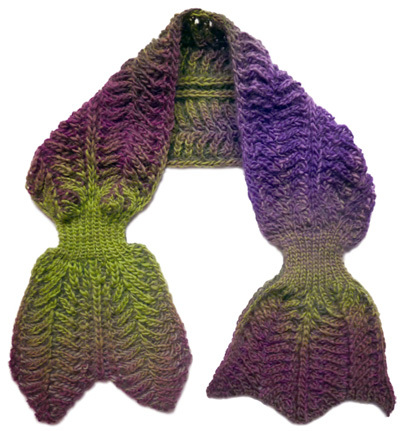 I suggest that you practice this pattern using scrap yarn before beginning the scarf. In brioche knitting, a stitch with its yarnover is considered ONE stitch. The yarnover is never counted separately. This is very important to remember – imagine a stitch and its yarnover as a stitch with a shawl around its shoulders. Edge stitches are worked using MC only. Mark one thread by hanging a marker on it as it comes off the ball. This will be the MC. The other unmarked thread will be the CC. After a few rows, hang a marker on the RS. Also hang a marker on the middle stitch. 4 stitch left slant decrease: Slip the next 4 stitches knitwise, one at a time, onto right needle, brk the following stitch, then pass the 4 slipped stitches over the stitch just worked. 4 stitches decreased. This places the first of the five stitches (the marked stitch) on top of the others, and slants to the left. 4 stitch right slant decrease: Brk1, place this stitch back on left needle, pass the following 4 stitches over, then return stitch to right needle. 4 stitches decreased. This places the last of the 5 stitches on top of the others, and slants to the right. m1 (make 1): bring yarn between the needles to front of work, then over right needle to back of work. When m1 is followed by a yf sl1yo, you will then need to again bring the yarn forward under needle for the beginning of this next stitch. Row 1 (RS, MC): K1, yf sl1yo, m1, brk1, m1, yf sl1yo, [brk1, yf sl1yo] twice, 4 stitch left slant dec, yf sl1yo, [brk1, yf sl1yo] twice, m1, brk1, m1, yf sl1yo, brk1, yf sl1yo, m1, brk1, m1, yf sl1yo, [brk1, yf sl1yo] twice, 4 stitch right slant dec, yf sl1yo, [brk1, yf sl1yo] twice, m1, brk1, m1, yf sl1yo, k1. Do not turn; slide stitches back to other end of needle. brk1: This is the middle stitch; it helps to hang a marker on this stitch. Row 1 (RS, CC): Sl1, brp1, sl1yof, p1, sl1yof, [brp1, sl1yof] 5 times, brp1, sl1yof, p1, sl1yof, brp1, sl1yof, brp1, sl1yof, p1, sl1yof1, [brp1, sl1yof] 5 times, brp1, sl1yof, p1, sl1yof, brp1, drop CC leaving yarn to front, sl1. Turn work. sl1yof: This is the middle stitch. Note: In this row, the first two and last two "sl1yof" stitches in each half are worked over a yo, so you will be slipping a yo as well as making one to form a double yo. Row 2 (WS, MC): P1, *[sl1yof, p2tog] twice, [sl1yof, brp1] 5 times, [sl1yof, p2tog] twice, sl1yof*, brp1, rep from * to *, end with p1. Do not turn; slide. brp1: This is the middle stitch. Note: In the row above, the p2tog is worked over a double yarnover. Row 2 (WS, CC): Sl1, [brk1, yf sl1yo] rep to last 2 stitches, brk1, drop CC leaving yarn to back, sl1. Turn work. Using Two-Color Italian Cast-On, cast on 41 stitches, beginning and ending with MC knit stitch. Set-Up Row 1 (WS, MC): P1, [sl1yof, p1] to end. Drop knotted stitch from Two-Color Italian Cast-On. Do not turn; slide stitches back to opposite end of needle. Set-Up Row 1 (WS, CC): Sl1, [brk1, yf sl1yo] to last 2 stitches, brk1, drop CC leaving yarn to back, sl1. Turn work. Set-Up Row 2 (RS, MC): K1, [yf sl1yo, brk1] to last two stitches, yf sl1yo, k1. Do not turn; slide. Set-Up Row 2 (RS, CC): Sl1, [brp1, sl1yof] to last 2 stitches, brp1, drop CC leaving yarn to front, sl1. Turn work. Set-Up Row 3 (WS, MC): P1, [sl1yof, brp1] to last 2 stitches, sl1yof, p1. Do not turn; slide. Set-Up Row 3 (WS, CC): Sl1, [brk1, yf sl1yo] to last 2 stitches, brk1, drop CC leaving yarn to back, sl1. Turn work. Begin Rodekool Brioche Lace Stitch Pattern. Work in Rodekool Brioche Lace Stitch Pattern until you are ready to work Row 25 (RS, MC). Carefully divide the stitches by slipping the MC stitches onto working needle and CC stitches onto holding thread or needle. You might first run a lifeline through the CC stitches to keep from dropping one. 21 stitches MC and 20 stitches CC. Ribbed Row 1 (RS, MC): K1, place CC thread to back, brk1 to last stitch, k1. Ribbed Row 2 (WS, MC): [P1, k1] to last stitch, p1. Ribbed Row 3 (RS, MC): [K1, p1] to last stitch, k1. Rep last 2 rows for total of 16 rows ending with a WS row. Place these MC stitches on holding thread or needle. Place CC stitches onto working needle. Ribbed Row 1 (RS, CC): P all stitches. Ribbed Row 2 (WS, CC): [K1, p1] to end. Rep Ribbed Row 2 for total of 16 rows ending with RS facing. Place all stitches back onto working needle, alternating MC stitch then CC stitch, beginning and ending with a MC stitch. Row 1 (RS, MC): K1, [yf sl1yo, k1] to end. Do not turn; slide stitches to other end of needle. Row 2 (RS, CC): Sl1, [brp1, sl1yof] to last 2 stitches, brp1, drop CC leaving yarn to front, sl1. Turn work. Row 3 (WS, MC): P1, [sl1yof, brp1] to last 2 stitches, sl1yof, p1. Do not turn; slide stitches to other end of needle. Row 4 (WS, CC): Sl1, [brk1, yf sl1yo] to last 2 stitches, brk 1, drop CC leaving yarn to back, sl1. Turn work. Work in Rodekool Brioche Lace Stitch Pattern until piece measures 17 inches from ribbed keyhole. The sample has 77 rows in this section. Repeat Ribbed keyhole, then continue with lace as per Middle Lace Area of Scarf. When the third lace area is the same length as the beginning lace end, BO using the Italian BO. Weave in ends and block. When blocking, do not touch this yarn with a hot iron, it contains nylon which melts. Nancy Marchant was born in Indiana but now lives and works, as a graphic designer, in Amsterdam, the Netherlands. 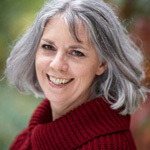 She has written articles for both Vogue Knitting and Interweave Knits on the brioche stitch and is the author of Knitting Brioche. Find out more about Nancy and the brioche stitch at her website, briochestitch.com.